Zion Lodge Number 1 F. & A. M.
This huge building is a consequence of social changes that developed with the emergence of an urban, white-collar, middle class in cities. It may also be an example of the misinterpretation of a short-lived demographic trend. As Detroit became an industrial city following the Civil War, more men held administrative and managerial jobs in factories and offices. As the urban middle class population grew, the pool of men available to join fraternal organizations grew rapidly. Fraternal organizations have a long history in the American colonies and the United States, but urbanization and employment changes allowed them to flourish about a century ago. Many of these men did what we now call male bonding by joining these organizations that provided camaraderie, entertainment and, from time to time, performed social good works. The Masons were one of the oldest and most prestigious of these organizations, but there were numerous similar ones for men to join, many linked to religions. Today, we have time-use studies monitoring how nationally representative samples of the population actually spend their time. There were no time-use studies in the late Nineteenth Century, but it appears that substantial numbers of middle-class men joined these fraternal organizations and frequently participated in their activities and social events. Presumably, children were raised primarily by their wives who spent most of their lives at home and seldom joined the labor force. The Masons may be the only social organization in Detroit that can trace its local origin back to that brief period between about 1770 and 1796, when the British controlled the village and its fort. Their numbers in Detroit apparently started to increase rapidly in the 1870s and 1880s. Until the 1890s, the various Masonic chapters met in rental quarters. In 1892, a dozen or so Masonic groups got together, decided to purchase property at the intersection of Lafayette and First Street, to erect a large temple. Architects George Mason and Zacharias Rice were commissioned to design a building sufficient for the needs of Detroit's Masonic community for the next fifty years. The Masons occupied their new home in 1896. This was the time of rapid growth for Detroit’s Masons, and by 1908, their Temple at Lafayette and First was far too crowded. Administrators purchased adjoining land and asked George Mason to design an addition, but after considering their options, they decided that they could not expand their Temple enough to meet their pressing needs since their membership was booming. By 1913, Detroit’ Masons were considering a massive new Temple. The result is the impressive building you see in the picture. They focused on their very rapid growth in the late 1890s and early 1900s and opted to build a huge Masonic Temple, one that proved to be sufficient for more than the next half-century. The Masons purchased a spacious tract on Bragg Street at the intersection of Second Avenue. This gave them the opportunity to construct a Temple that would never seem crowded by neighboring buildings. And it would face beautiful Cass Park with its interesting statue of a pensive Robert Burns—the only statue of the Scottish poet in metropolitan Detroit. The city later changed the name of Bragg to Temple Street. By 1920, the city’s Masons had raised 2.5 million dollars for this structure. President Washington was a mason and some of his personal tools were brought to Detroit for a symbolic initiation of construction. In 1922, the cornerstone was laid and, four years later, the edifice was completed. 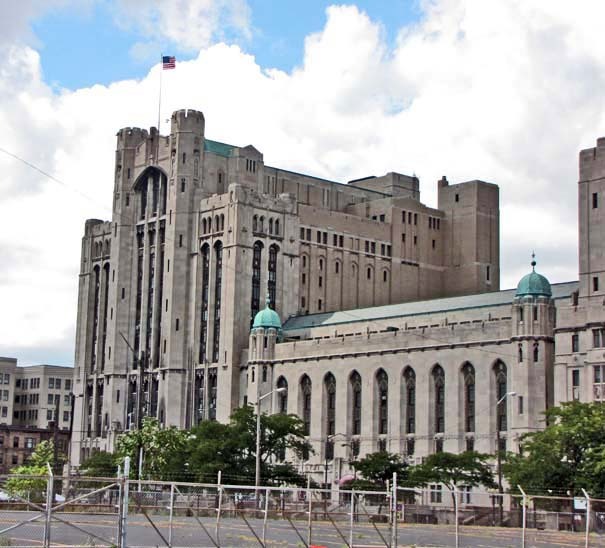 Containing 12 million cubic feet of space, it is the largest Masonic Temple in the world. Most fraternal buildings constructed in the United States up to this time used Greek or Egyptian themes in their architectural style. Detroit’s Masons continued to use George Mason as their architect. Hawkins Ferry, in his definitive book, The Buildings of Detroit, claims that George Mason was given considerable license to design a building of his choice so long as it was consistent with Masonic tradition. The architect knew that the Masons had their origins in the guilds of Europe; indeed, many members of the Masons helped construct the great cathedrals of northern Europe. Thus, George Mason selected Gothic to be the style of his great structure. Detroit’s Masons desired a building that would suit their needs for ritual and for commoraderie. Thus, there are 28 units within the edifice grouped into three major divisions: the ritualistic tower, the large auditorium that could seat 5,000 and the Shrine Club. When completed, the large auditorium had the second largest stage in the United States. The building was designed so that as many as 50 Masonic groups could meet simultaneously and carry out their rituals and activities. This building is dominated by the Ritualistic Tower that overlooks Cass Park. The original plans called for an 800-seat auditorium at the top of that tower, but funds have yet to become available for that purpose. Within the building, there is a Scottish Rite Cathedral with seating for 1600—a cathedral designed so that friends and relatives could watch the Scottish Rite degree ceremonies. There is also a huge drill hall so that Masons could practice their marching and other activities. Two ballrooms are in the structure. The larger—Fountain Ballroom—was designed to seat 1,800 at banquets and for as many as 1,500 couples at dances. Large kitchens were included in the design with the aim of making them able to serve 5,000 in a day. There were upwards of one thousand rooms in this building, many of them were used, from time to time, as hotel rooms by traveling Masons. Detroit’s Masons misjudged growth trends when they constructed their first large Temple in the 1890s. They could not have foreseen the Great Depression that devastated Detroit from 1930 to 1940. Yhey greatly greatly misprojected growth when they constructed this building. Participation in the Masons increased rapidly around 1900, but demographic and social changes occurred in the Twentieth Century to substantially reduce membership in fraternal organizations. Spectator sports became popular; first, baseball, then later, football, basketball, hockey and auto racing. And then, middle- and upper-class men began participating actively in competitive sports rather than spending their week-ends in lodge meetings: first, golf, then much later, running and bicycling. Importantly, there was also a change in the organization of the marriages of middle- and upper-class individuals. Norms gradually called for much more involvement of fathers in child rearing. With the near full-time employment of most wives, men found it desirable and necessary to spend time with their families rather than with fraternal organizations. Presumably, the nation’s many fraternal groups will not disappear, but their memberships may continue to decline and those that own attractive buildings with theaters suitable for music and the theater may find them most frequently used for those purposes. This is still an active Masonic Hall, but it is best known in Detroit for its theater. I recall seeing a marvelous performance of the Metropolitan Opera in the theater shortly after moving to Michigan in 1967. The huge stage of that theater made it very suitable for opera. If you go to the webpage of this building, you will find relative little information about Masons, but much about the musical groups and theatrical events scheduled for this marvelous building. In 2007, the Masons were far in arrears with their city taxes and water bills. There was a danger that they might lose this building. At that time, the owners contracted with Olympia Entertainment Management—owned by the Ilitch family—to manage the theaters in this Temple. The Ilitchs announced that their firms had spent million restructuring the debt of Masonic Temple and to promote its use for entertainment and for private parties. However, in 2010, Olympia Entertainment announced that it was terminating its contract with the Masons. Frankly, given the current economic conditions in Detroit, there are too many large downtown venues for entertainment. I assume that the Ilitch family just could not book enough use for this vast building to turn a profit. The Masons announced that they would continue to operate the structure but I suspect they will face challenges in the short run, In 2012, the local power company threatened to cut off electricity unless bills were paid and, in 2013, Wayne County threatened foreclosure for a failure to pay taxes. At one point in early 2013, famous Detroit artist, Jack White, of the White Stripes donated $142,000 to allow the Masons to pay their property tax bill and retain this building. In the spring of that year, the Downtown Development Authority announced it was considering building a major new arena in the nearby space located between Woodward Avenue and Cass Avenue. This may be a 660 million dollar project to be supported, in part, by the tax revenues that the Downtown Development Authority collects and, I assume, by the Ilich firm whose holding company owns the Detroit Red Wings hockey team who will be the primary tenants of the new arena. Should the area be built and if there is continued downtown economic development, it is possible that the Masonic Building could be converted into a large hotel. Artist and sculptor for the interior: Corrado Parducci. Use in 2013: This serves the as the Temple for the Masonic community of metropolitan Detroit. Until recently, the huge theater was an active venue for musical and theatrical presentation.